My grandmother always said “let your housework go a bit in the summer, so you can spend your time outside and enjoy God’s creation while the weather is nice”. I agree whole heartedly. 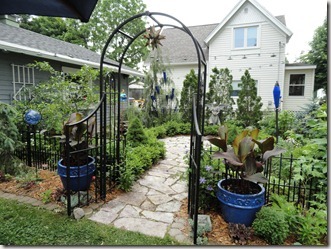 So I decided to get out and explore the greater area by doing the Outagamie Master Gardener’s “Garden Discoveries” walk. Well, actually there was a little walking, but mostly driving. I am sure I put more than 40 miles on the truck by the time I was finished. It was scheduled to run from 10 to 4 and it took about that much time, to my surprise. 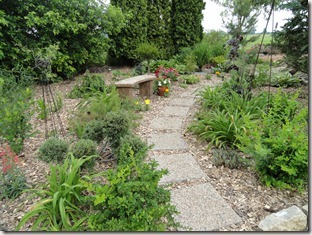 A favorite garden was very orderly. 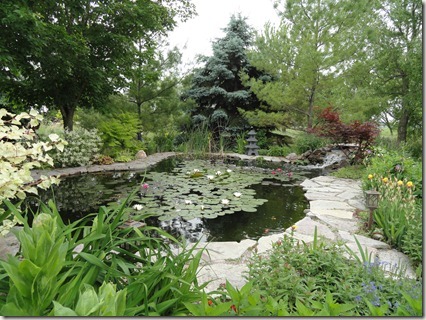 It had a small pond, and the entire yard was lined with wrought iron. There was a handy kitchen garden just outside the kitchen door. 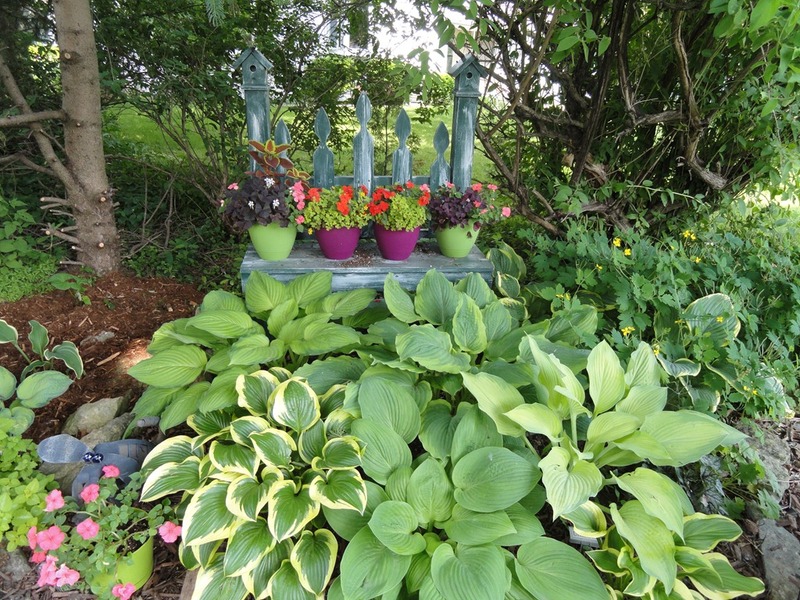 Cobalt pots popped against the green foliage. 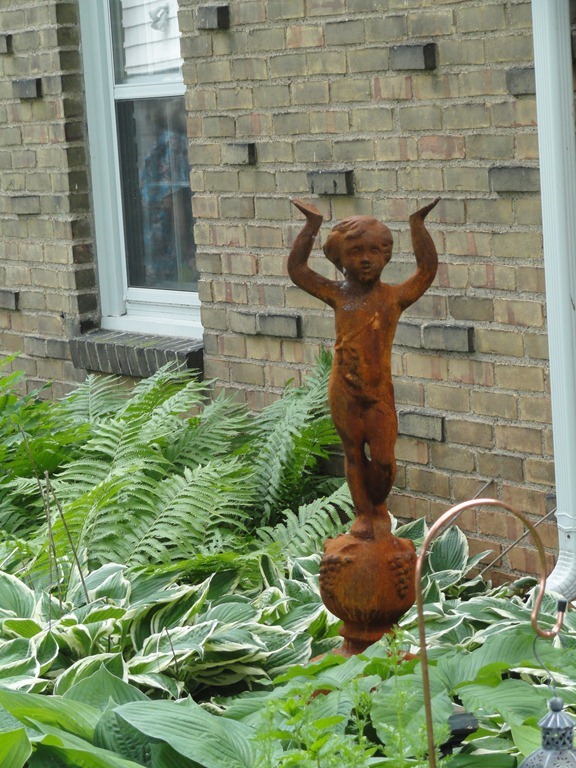 The residents had placed many unusual , antiques and curiosities throughout the garden that added a high interest factor for me. 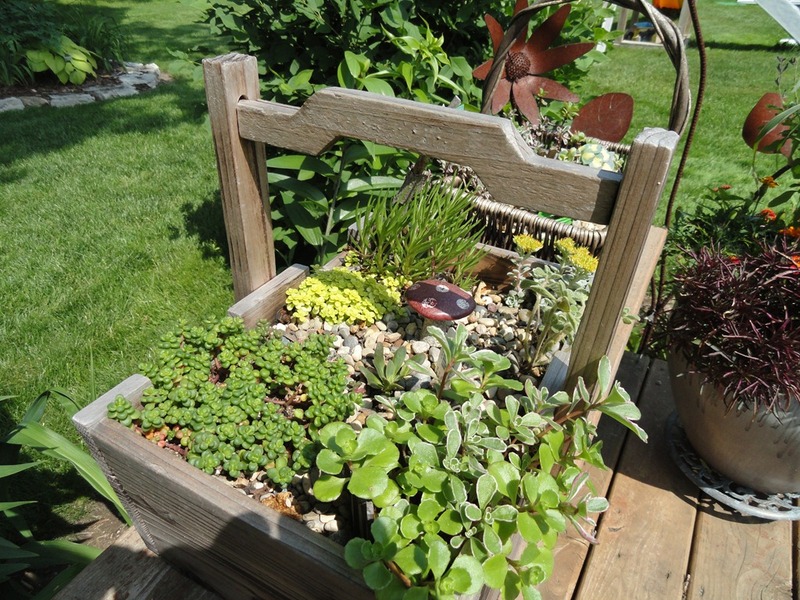 Succulents were popular in most gardens and found along stone lined walkways, in baskets, pots, and even in a picture frame. Some succulents are winter hardy, others are brought back inside before frost, and one gardener said just turn the potted collections on their side in a protected spot and they can stay outside all winter. I am used to trying to grow things in sand back in Michigan, but here in NE Wisconsin we have lots of clay. 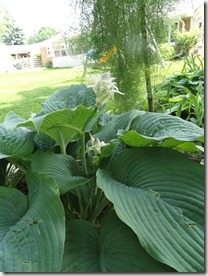 Hostas do very well as do roses. 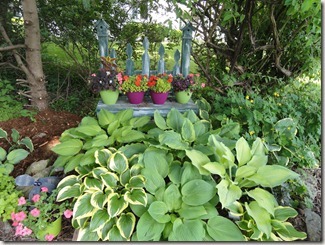 Many people had wild overgrown gardens with vast varieties of hostas, perennials, and flowering shrubs mixed together. 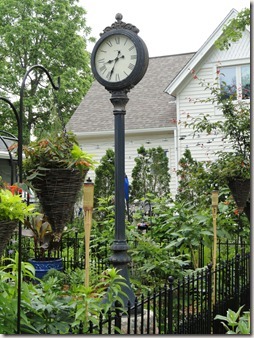 One garden boasted of having over 400 varieties ranging from tiny starters to giant man-eating plants. 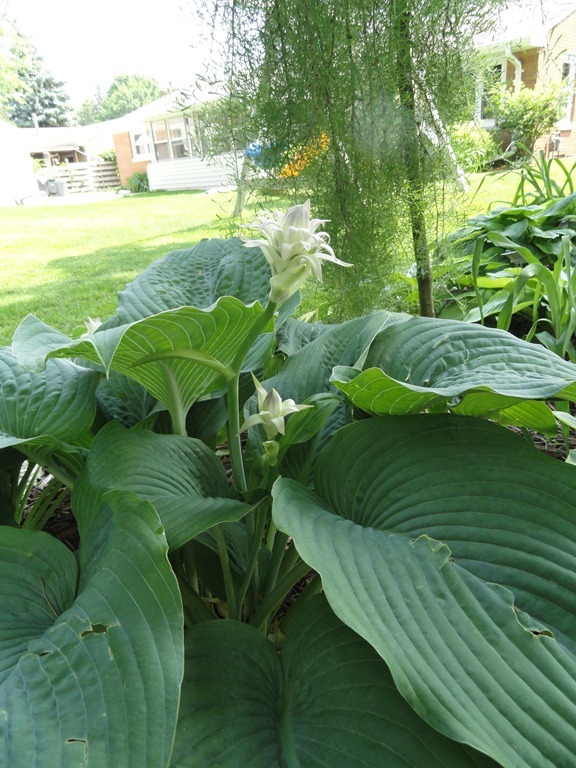 I saw an overwhelming amount of hostas on Saturday, perhaps so many that I lost my appreciation after a while. 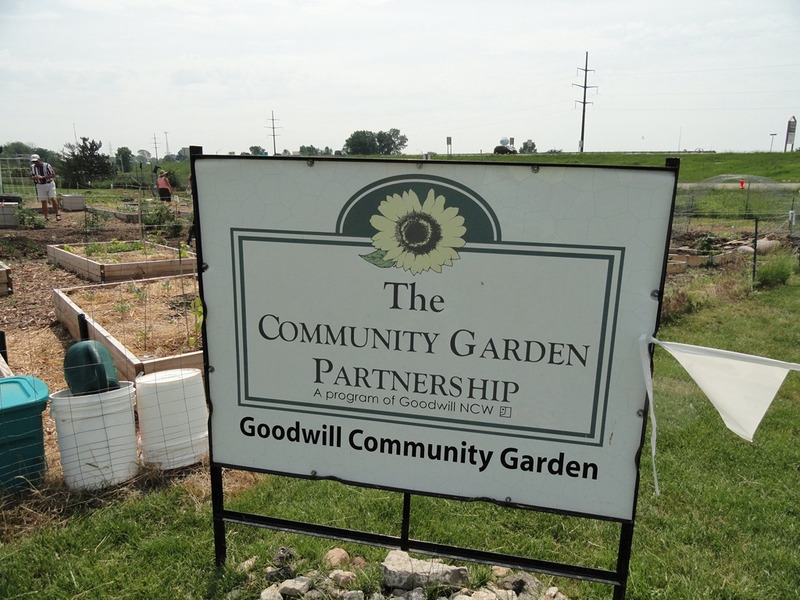 The Community Garden Partnership at Goodwill turned out to be quite a pleasant surprise. A knowledgeable guide gave me a personal tour and expla ined that this garden area was used by a very diverse group of people: from the disabled to people of various ethnic backgrounds. 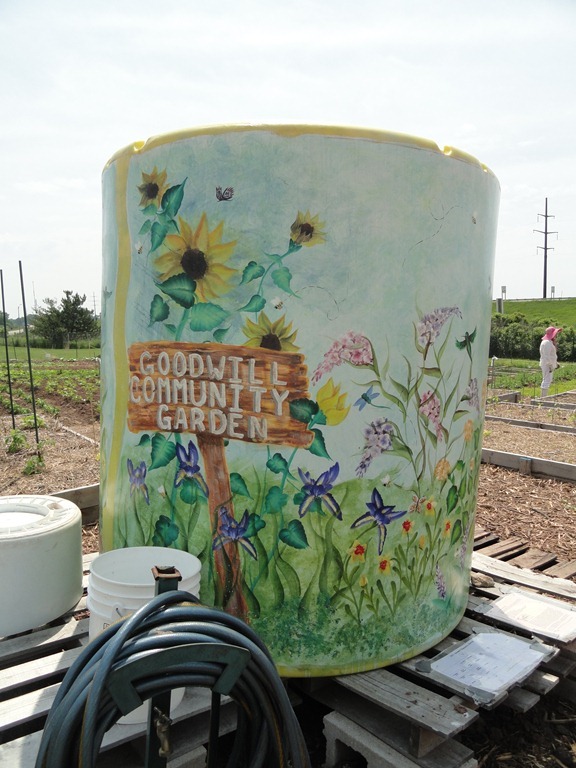 Water is provided at the site by a huge gaily painted water tank donated by a local farmer. Compost is provided by the city. 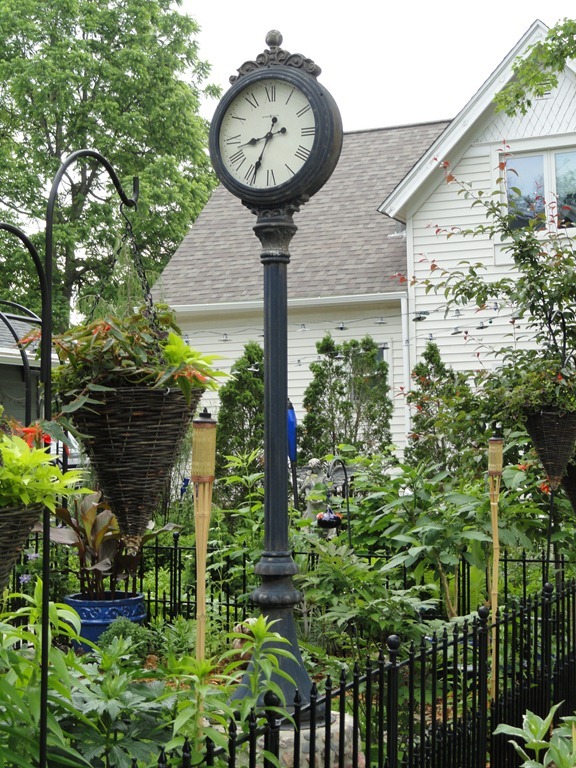 Then folks just have to bring their seeds, plants, posts, fencing, and other accoutrements for gardening to get on with the task of gardening. 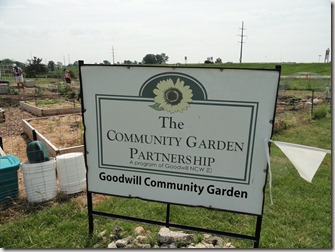 My guide was not involved with this particular garden,but with one the community garden in Neenah just to the south. She said many people were applying the Lasagna Gardening method. She asked me if I was familiar with that. I didn’t want to appear clueless, so I guessed that it was a garden much like what people call a kitchen garden. Nope. I had guessed badly. Kindly ignoring my ignorant guess she went on to explain it was a method of layering the garden fill to create a fertile but loose soil for a raised bed. 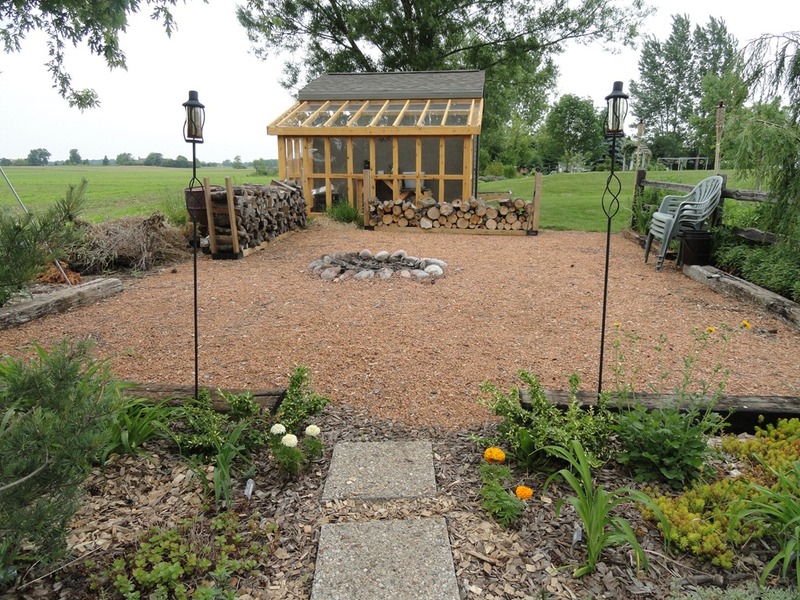 The layers consist of cardboard, newspaper,dead leaves,grass clippings, compost, and manure if available. 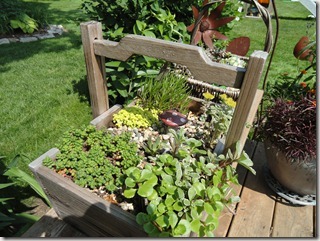 Gardening in raised beds is especially good for Wisconsin since it is hard for roots to push through clay. I will say it is a fascinating way to create fill for a raised bed and am considering to begin setting up one such garden for myself this Fall. Many of the eight gardens had ponds from small ones to eight hundred gallon ponds complete with a long set of falls creating a place for peaceful meditation. I especially felt at home leaving the obvious gardening areas to the wild grassy section lined by tall trees and filled with flowers and grasses commonly found in the Wisconsin prairie. Birds were singing their hearts out greeting the day. In the city I don’t hear the birds I am used to hearing in the meadows and orchards of northern Michigan. 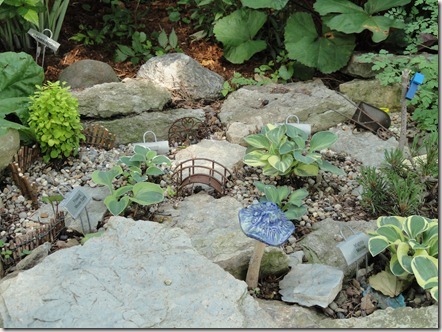 Having birds as part of the garden is so inviting, yet can only be done with some aspect of “the natural” for them to feel at home. To me, a complete garden is not only beauty to the eyes and nose, but to the ears as well. 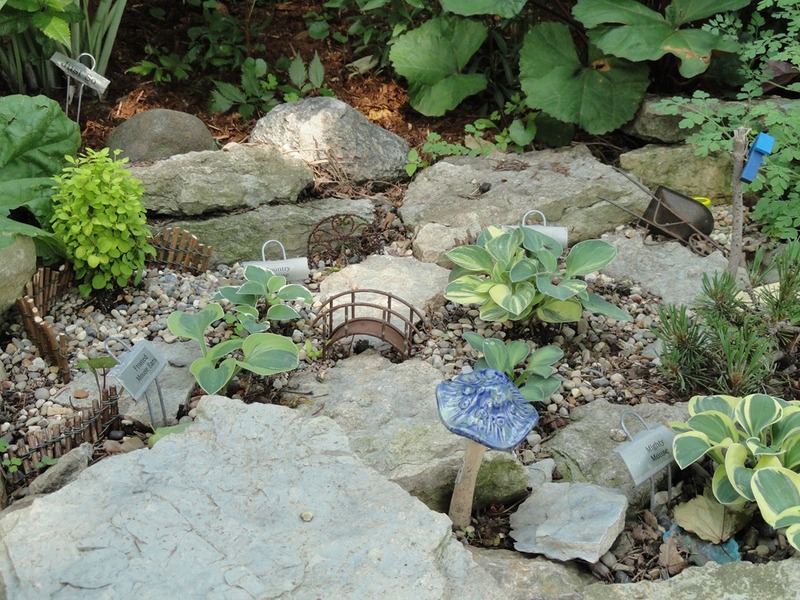 My friend Deb would have especially enjoyed one garden that provided a place for the wee people or the fairies; complete with tiny bridges, signs, benches, fences, and other miniatures. 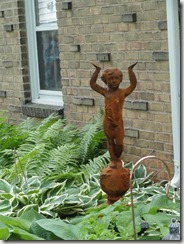 All gardens were filled with typical fare such as gazing balls, sculptures, metal work, and junk yard treasures. Of course spaces to relax with fire pits, chairs, benches were blended into many gardens. Lots of interesting walkways and arches provided direction for movement through the gardens. 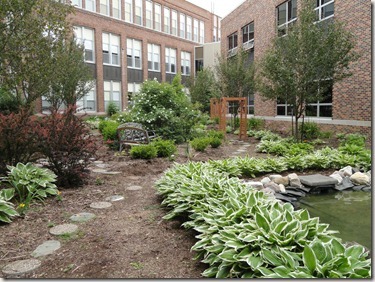 I ended my day with exploring a “Secret Garden” in the center courtyard of Appleton West High School. 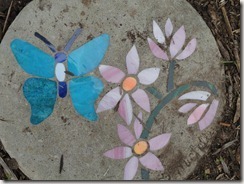 I immediately thought of my friend Connie who created a Secret Garden many years ago at a school where we both taught. It was a novel idea at the time, and over the years many others piggy-backed off the practice of having students create garden environments. 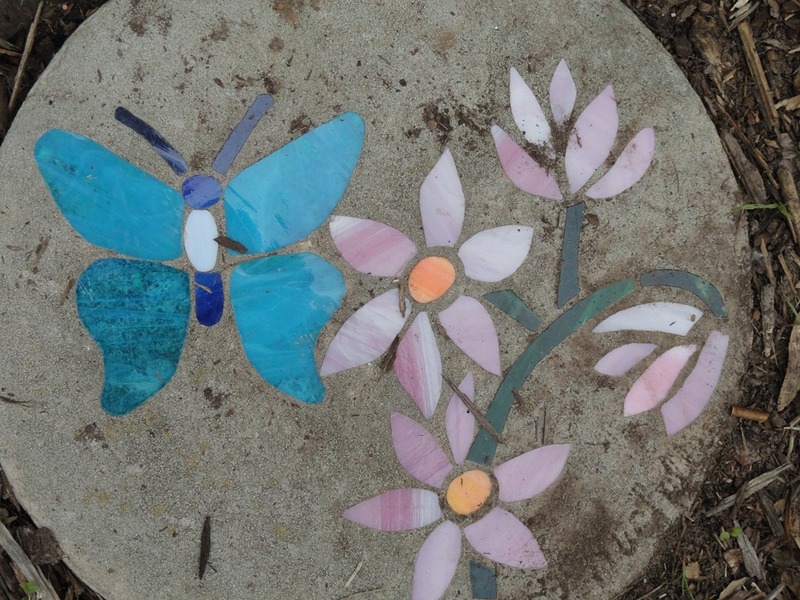 The stepping stones in this garden were created in an art class and added additional beauty and creativity to the space. It was wonderful to see what I would call “Extreme Gardening” but nicer to come home to what is more practical and manageable. I did learn things, many Master Gardeners were available at all sites to provide tips and answer questions. There were many useful handouts. I could not have taken on this tour without my iPhone and its GPS. I easily traveled from one point to another and never got lost. 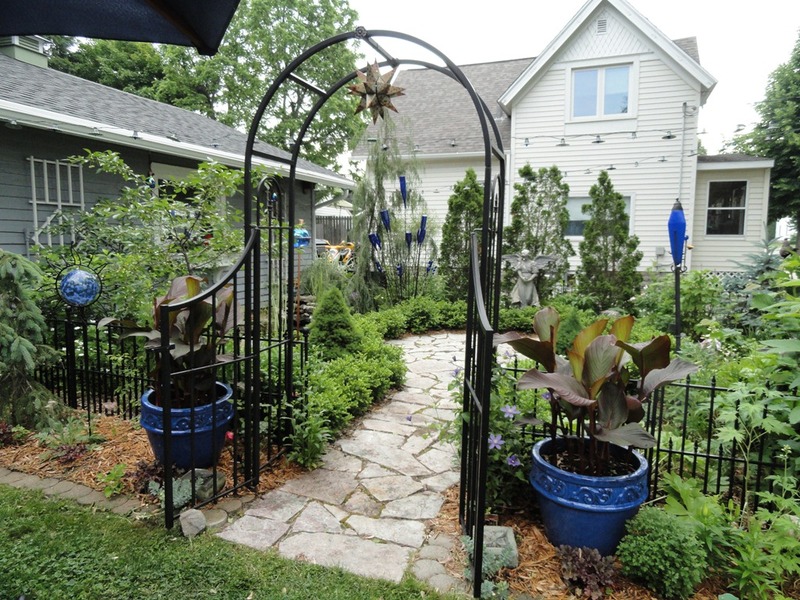 It has been several years since I have gone on a garden walk and it was perfect weather,unlike the last two days.So rain, rain, go away, come again more sparingly, some other day, I want to go outside and play in MY garden.